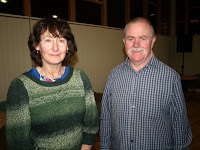 The first Boyne Readings and Open Mic session of the year took place in the Village Hall, Knightsbridge, Trim last Thursday18 February. Paddy Smyth was master of ceremonies, Susan Connolly, and I read from our own collections to a small but appreciative audience in the Village Hall. Susan read some of her finest poems and I read prose. Members of the audience read in the open mic session. There was a great variety of style and content to the poems and stories read, some tinged with sadness, others hilarious and Michael Regan reenacted court room dramas from his time as a legal eagle. Tea and bickies were served afterwards and I hit the road for Navan. Sorry I missed it Michael, got good reports. Well done! Thanks Michael. Paddy said you were down the country drinking pints! Finally got around to congratulating you on those readings. See you on Thursday!